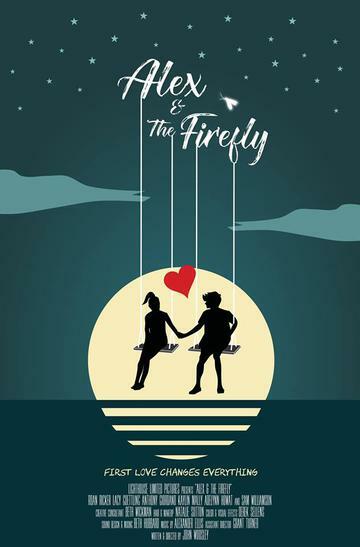 I will confess that I had to adjust my mind to the idea of a film set in 2001 being portrayed as retro, but such is the case with writer/director John Woosley's coming-of-age love short called Alex & The Firefly. While it may have taken time for this film journalist to adjust, Woosley is correct in noting that it's only been in the past 20 years that relationships and romance have become dominated by texting, selfies, instant messaging, cell phones and more. What would have been portrayed in my romantic heyday as a 50's style romance is, instead, put in those years before technology influenced romance. It's an era that seems almost quaint now, a full generation having grown up under the infuence of and guided by the digital world's influence on dating and falling in love. In this story, Alex (Roan Ricker) expected to spend his summer before high school pining for Lucy (Kaylin Mally). When Lucy introduces him to her friend Nina (Lacy Goettling), however, things change and before long Alex is dealing with the trials and tribulations of first love and first heartbreak. If you weave hints of John Hughes into the sentimentality of Rob Reiner, you have an idea of what to expect from Woosley's 33-minute short film that is unabashedly retro, relentlessly quaint, and quietly honest in its portrayal of life before love and leaving could all be handled with the abruptness of a text message or the finality of a humiliating Tweet. Alex & The Firefly isn't a particularly original film, but what it lacks in originality it makes up for with comfortable familiarity and an unexpected warmth toward all its characters. Roan Ricker makes for a convincing Alex, though looking somewhat older than the character he portrays Ricker leans into those seemingly insurmountable insecurities we all had on the cusp of our high school years as we attempted to find our places in the world and a tribe we could call our own. Up-and-coming Kaylin Mally, whose cinematic debut was in American Honey and who appears in writer/director Michael Joiner's upcoming Christian Movie, is appropriately filled with angst and jealousies and finally resolution as Lucy, while newcomer Lacy Goettling's turn as Nina is multi-layered as she goes from playful to more emotionally complex over the film's running time. Fellow newcomer Anthony Giordano also deserves kudos for his work as Zach, Alex's best friend and bicycle racing compadre who seems to frequently have a hand in every direction that Alex's life takes. Alexander Ellis's original music nicely complements the film's retro stylings, while Woosley's own lensing affords the film a look that harkens back to the many older teen flicks we know and love. Alex & The Firefly may not be a life changing film, but it's an entertaining and enjoyable one that you should check out if you get a chance to see it while it's on its festival run. For more information on the film, check out the film's Facebook page linked to in the credits.